Phew – what a scorcher! After many months in the planning, the only plan that could not be guaranteed was the weather. For once, the weather gods smiled, and the day was sun-drenched for this special celebratory match between the Beds and the Insurance Celebs XI. Mr Chairman had a broad grin on his face throughout the day, as he relished his 24-hour release from the confines of the score box, giving him the chance to celebrate his 80th birthday and mingle. And mingle he did! Not only that, but it was also a game he couldn’t lose. As well as being chairman of the Bedouins, he is president of the Celebs, so a win either way could result in a jolly “Well done, my lads” from him. The fact is that the Bedouins came up against a team that contained no fewer than three sons of Celebs, who not only brought the average crashing down, but also ensured them a decent bit of bowling and a pretty good bit of batting too. The Bedouins welcomed back skipper JB after a somewhat lengthy lay-off with a damaged fetlock. His movement between the wickets may still not have been the sharpest, but he showed no loss of batting technique in hitting 43 before retiring and walking – very slowly – from the field, having registered a labour-saving nine boundaries in his innings (83.7%). Fellow opener Andy Hill, himself no stranger to the physio’s ministrations, also favoured boundaries to singles and hit four of them in his 17 runs before being bowled. He was followed by John Howells, who displayed his customary mix of immaculate forward defensive with some silky drives in hitting 33. 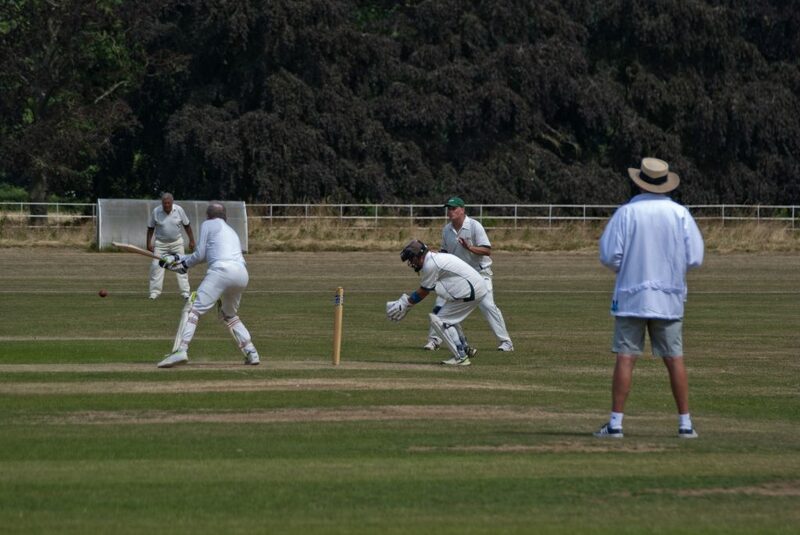 After a couple of quick wickets, it was left to Paul Lippitt (24 not out) and Lee Bywater (15 not out) to put on around 40 runs, to take the total to a competitive 182 for 5, the match having been reduced to 30-overs-a-side, owing to the tropical heat. 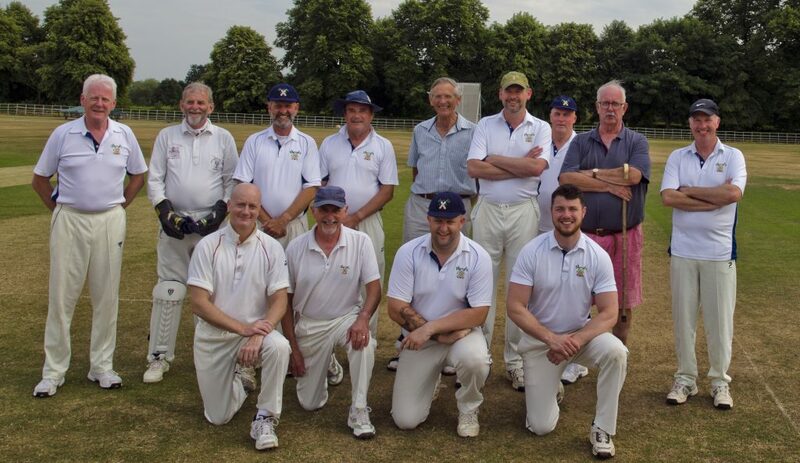 The Celebs team contained a few younger members, who were largely instrumental in the visitors reaching a winning total for the loss of just three wickets. 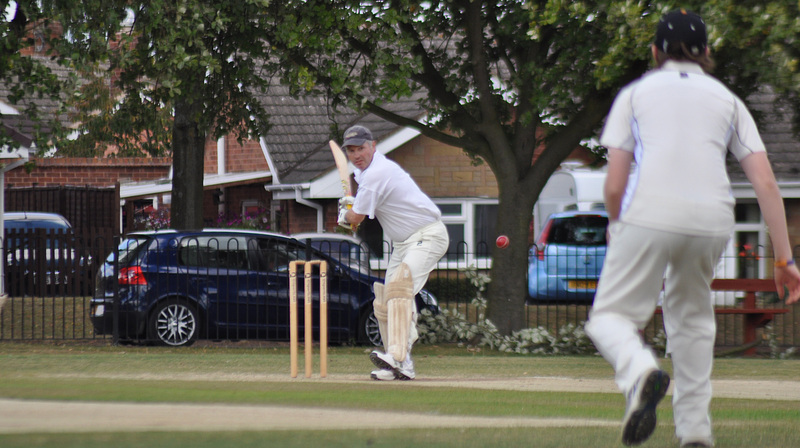 Young Ben Oakley showed his dad the way with a patient 42 retired, having opened the batting. The fireworks came from Ryan Thorpe (another “son of … “), whose physique gave a hint of what was to come; he retired on 42, having hit seven boundaries and a six. Among the bowlers, there were two wickets for Mike George and one for Adrian Susman. David Pearson made one of his very welcome trips from “oop north” to complete five overs (4.5 overs more than he completed last year, when he “went in the leg” after one ball). The Celebs made 185 for 3, to complete a seven-wicket win. Chairman’s Note: My thanks to all those who took part and who came to watch and engage in a fair bit of “Do you remember when … ?” The “girls” did a wonderful job of catering for the hordes, and Sam was kept beavering away behind the bar. 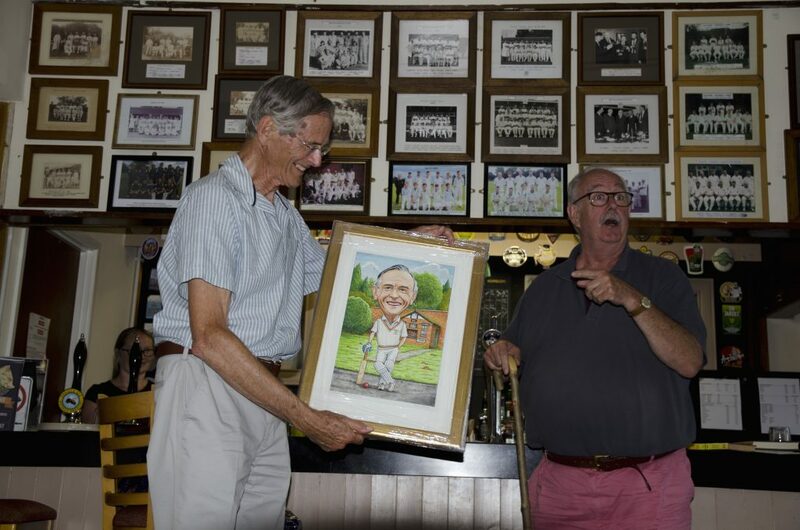 At the end of play the Beds made a presentation to the elderly gent – a superb cartoon-type portrait by Geoff Tristram – and he went home as happy as Larry. Great day!